Published on August 29, 2014 in Elections, General T&T, Parliament, People's Partnership, Politics and UNC. 11 Comments Tags: Guardian, Kamla Persad-Bissessar, Politics, T&T Govt. The controversial Constitution (Amendment) Bill 2014 was passed in the Senate last night with the support of Independent Senators Dhanayshar Mahabir, Rolph Balgobin and David Small. After almost three days of heated debate, the bill was passed at 11.09 pm with a total of 18 senators voting for it and 12 against it. All the Opposition Senators present and six independents voted against the bill. However, the bill received the three Independents’ votes only after Prime Minister Kamla Persad-Bissessar agreed to accept an amendment to the controversial runoff clause put forward by Mahabir. Mahabir proposed that a third place candidate in an election, who gains 25 per cent of the votes and who is within a margin of not less than five percentage points of the second place candidate, also be allowed to contest the runoff election. He said this triage system will give all parties a fairer chance in an election and allow the third parties a chance. Initially, the Government had proposed that only the top two candidates would contest the runoff if neither of them gained at least 50 per cent of the votes. But many argued that this would kill off third parties. As it turns out, however, in the runoff election as proposed by Mahabir, the Government also agreed to waive the 50 per cent winning margin for the three candidates. This means the winner of the runoff could win the seat without gaining at least 50 per cent or more of the votes. Persad-Bissessar also accepted Balgobin’s proposal to recall a non-performing MP after two and a half years instead of three. The PM also accepted an amendment proposed by Small that people wishing to recall MPs must get the support of 20 per cent of the voters in a constituency to apply for a petition. The original clause had a 10 per cent threshold. Small, supported by his colleagues, said this would avoid mischief. There was heated debate on the controversial bill during the committee stage, after all the remaining Senators had earlier made their contributions. 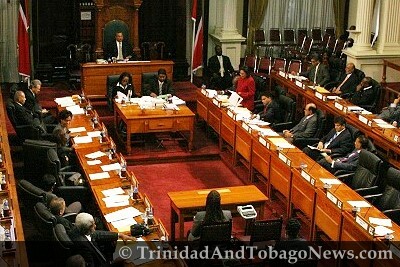 During discussions in the committee stage, PNM senators maintained a non-supportive stance, expressing their complete rejection of the bill because of the fact that there was no consultation on the runoff aspect. During the recall amendment discussion, PNM Senator Faris Al-Rawi wanted to know where the 20 per cent figure came from and what did the consultations say about it. Small replied that he didn’t just pluck the 20 per cent out of the air. He said after discussions with an international recall expert, he concluded that 20 per cent, which could mean 5,000 or 6,000 voters in T&T, was reasonable. This is the RECALL process in B.C. Canada. 23 recall attempts failed to satisfy the requirements. Only one recall succeeded so far. Recall is a process that allows registered voters to petition for the removal of a Member of the Legislative Assembly between elections. Any registered voter can apply to have a petition issued for the recall of their MLA (the elected Member representing their electoral district in the Legislative Assembly). A registered voter who wants to start a recall petition must obtain an application form from the Chief Electoral Officer. The completed application form must be submitted to the Chief Electoral Officer with a non-refundable processing fee of $50 and include a statement of 200 words or less of why, in the opinion of the applicant, the Member should be recalled. A Member cannot be recalled during the first 18 months after their election. If the application is complete and meets the requirements of the Recall and Initiative Act, a petition is issued to the applicant (called a “proponent”) within seven days. The proponent then has 60 days to collect signatures from more than 40% of the voters who were registered to vote in the Member’s electoral district in the last election, and who are currently registered as voters in B.C. The proponent may be helped by volunteers when canvassing for signatures. When all the signed petition sheets are submitted, the Chief Electoral Officer has 42 days to verify that enough eligible individuals have signed the petition. If enough valid signatures are on the petition, and the financing rules have been met by the proponent, the Member ceases to hold office and a by-election must be called within 90 days. A recalled Member can run as a candidate in the by-election. I was quite impressed at the level of debate for this bill having listened to the presentations closely. The independents in my view won the day. The PNM will squash this bill at first opportunity. There are several things that changed in regards to the original bill. The independents got (1) a 20% threshold instead of the 10% as suggested by the government (2) 2 1/2 year instead of 3 year to intiate a recall, (3) if a third party gets 25% of the votes and is 5% off the second highest polling party they can be part of the run off, instead of just two parties in the run off as was suggested by the government. Those changes are impressive. I am confident after all the emotional halabaloo is gone Trinis will realise that power really is in their hands. Trinidad has several active political parties PNM, UNC, COP, ILP, NJAC, MSJ, DNA, NAR, TOP etc. Under the first past the post system the standard was low, a party gaining 35% of the vote could win the seat. Today they are required to woo at least 50% of the voters (except in the 25% scenario) to their side. That means ethnic voting will lose its appeal in the second ballot and people will be looking for someone who could represent them effectively, to send to Parliament. The PNM embrace the “run off” in their Constitution but does not want it for the nation. To be clear the run off does not favour any political party. It truly places power in the hand of the voter. The next change in the Constitution would be “fixed date” elections. That has its pros and cons. With fix date, campaigning could start a year before elections. Absolutely correct and the decision making that is in the hands of the voter shows maturity of the population and democracy of the nation at work in the 21st. century in the small island of T&T. The opportunity to recall is to show that the power is in the hands of the population when their representative shows lack of presence at the community level and failing to do what is required for his/her electors on their behalf. The culture of getting thoughts to precede before action are indicators of maturity and hopefully gone are the days of badjohns, racial slurs, polarization of the society and hooliganistic behaviour by some of the people in general even at parliamentary level. Together we aspire together we achieve. You wish! It is still heartening to read the nostalgic yearning for ‘more democracy’ whatever that means. For my part, twisting and turning of words to express ‘better’ is worse than facing the real truth. In the last US election 2012 there was a 57.5% voter turn out. You will never get a 100% voter turn out. So the result is based on voter turn out not on those with the freedom to vote. If 50% of the electorate cast their vote then that is 100% of votes cast in the ballot box at that time. Percentages are worked out on the votes cast at that time. Any other percentages of the electorate that cast their votes are represented by # of votes cast at that time e.g., if there is disenchantment by the population and only 30% of the electorate voted then the ballot box would contain 100 % votes collected. The pundits then would come out with the fact that 70% of the electorate showed dissatisfaction in not voting. The returning officer who is tallying up the votes would say 55% of the votes collected was for candidate A etc. We had this in the 60s when the DLP refused to participate because of disenchantment expressed against the voting machines at that time. The PNM was sworn in by default. HAPPY!52nd ANNIVERSARY TO THE NATIONALS OF TRINIDAD AND TOBAGO!!! Scattered over the media is the greeting “Happy Independence Day”, from a collective viewpoint, what exactly does that mean? And how are we as the population suppose to accept or postulate on this expression, does this greeting measure our national content?, does it measure the gaps we have closed in our relationships with each other, does it measure any advancement in our development or does it measure our maturity as a nation? I recognize that there are no easy answers because at this time of year we are faced with more problematic worries than we have answers. We are further apart in our relationships than we are together. We are less trusting and more acrimonious in our trust of each than we ever were. Development is collective, not partisan, development is studied not marginalized, development is patience, argumentation, reasoning, rejection, acceptance, conviction and action all in the same package. This 52nd Independence Day comes with amendments to the constitution that questions the process, it comes when one party felt that it had “won” the other felt it had “lost”. If amendments to the constitution leaves people with the feeling of wins and losses then clearly there is a violation of understanding. The contents of the constitution should be neutral in application and concise in intent. But, it was a day for politicians because it was obvious that the word “we” meant different things to different groups of people. So, before finishing I ask again, what does “Happy Independence Day” really means? It means exactly what it expresses, “Happy Independence Day”. The vast majority of the people in T&T are not saddled with the acrimonious, divisive conflicts which exists on cyberspace.They live well with their neighbors, associates and friends of all races. Thankfully the party hacks on each side are career disturbers who consist of a small minority. Move among the people and you would soon discover this fact.